Developers from Gaijin have unique ability of entertaining us with thig we didn't care about much in the past. For example, when War Thunder was released, we were no great fans of tank/airplane games, but when we tried it, we are tanists for life. Well, almost, because now we have Crossout! Sort of War Thunder (more about this game on our blog) on four wheels. Or six. Or three, five or even on tank belts. 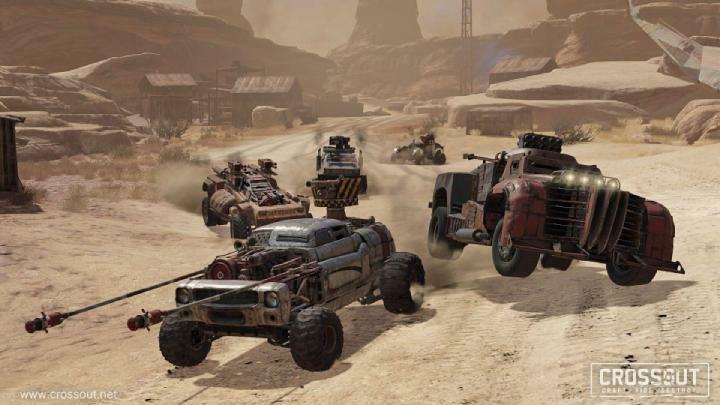 Because in this game you will build your own post-apocalyptic war vehicle from scrap like MadMax, which really reminds us of Battle Bots (that we sterted watching just because of Crossout). 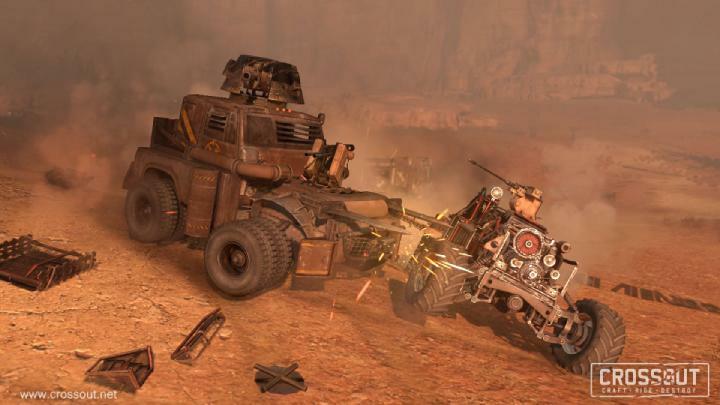 Then you take your overpowered scrap car and turn other cars back into scrap! That's gotta be fun right? Yes it is! There are tons of parts you can use and you can build basically anything you want, even fidget spinner or limusine! Especially later phases of the game offer insane possibilities when you unlock enough parts such as weapons, cabins, doors, wheels and alot more. We were sometimes starring on some creations on the battlefield with our mouths open and our carosery scrapped. The best part is how fast every game is! Battles in this game last for about two minutes and the fastest ones you can finish under 40 seconds. This means that every few minutes you can upgrade your vehicle and test it asap in new battle, slowly bringing it to perfection. For every battle you get scrap and a part that you can scrap or use in building your car. You can also sell it to other players on the market for a little bit of premium currency. This way you can save up for basically anything pretty fast and you can build your dream machine in no time. When you are done creating your perfect vehicle, you can share it with other players and they can use it if they have the parts needed for the creation. You even have PvE mode where you can play fast story driven raid battles against bots! We have to admit that we did not expect any complexity from these battles but some are really difficult and require great deal of teamwork. Fast cars carry stolen loot, heavily armored ones act as tanks, drawing attention while vehicles with the most firepower decimate the opposition. Basically it is similar to raids it World of Warcraft or any other mmo, except this is less chaotic and without any healers. Crossout is free to play, but the system of recieving scrap, parts and currency is quite generous so you don't have to be afraid of neverending grind to get what you want. On the other hand it is true that players who invest some mone in the beginning have instant advantage and F2P players will have to endure few rounds of injustice. Once you unlock few parts, most of differences between paying players and f2p ones are gone and only cosmetical ones remain. So if you get over the first few rounds, get ready for life of a really crazy postapocalyptic mechanic/warrior! And since it is free, why not try it today here?